The reason I came up with the Christmas Tree Poll is that this year is different for us. No pets! Therefore, we can put up whatever we want. We have several artificial trees; we've used those for many years--from 2 ft to 7 ft at one time. I think our 'current' ones are a 5 ft and 2 that are maybe 4 ft. They've always been put on solid end tables, due to having cats running around the house. And of course, the 2 ft one--it's been everywhere from here on my desk to on the counter in our main bathroom! I have no idea where/what we'll actually put up this year. It's too early to even think about that! My husband will want to decorate the weekend after Thanksgiving, so we have plenty of time to think about it. But in doing that Poll, I had an idea. I guess it'll depend on how the budget works out in December. I'd kind of like maybe getting a small, real tree for a change. Yes, it can get messy. And you have to be careful to keep it watered so that the needles don't dry out. But the 'smell' is fantastic. Again, this is just a random idea. I have no idea what my husband will think about it! As I said...there's plenty of time to think it over. I don't want to make you think I'm Crazy? BUT, I put my Tree Up October 16th. Yep, it's up and decorated. I have a Dog and a Cat. They have never bothered the tree. Well, they do drag the gold cloth I put under the tree. it's actually fun to watch the cat run and scoot it across the room. Well, Maybe I am Crazy ! I love that idea, Mona. And now that you mention 'options', we do have a fibre optic tree & a ceramic on (lights fit into holes in it) as well. Because we no longer have Christmas Day celebrations at our home (it is now our adult kids who do all the preparing), and we don't exchange Christmas gifts (we don't need anything), we don't need a large Christmas tree (real or fake) to take up space in our home. 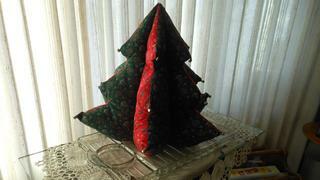 A dear friend who is a very active quilter, made this Christmas tree for us a number of years ago, and we just love it. When I change the theme on my page to the Christmas theme, or write a Christmas blog, I will include photos to show what we do to decorate our home for Christmas.